*Presence is shown for levels above 5ppm (mg/l) for cadmium, cobalt, copper, lead, mercury, nickel and zinc. For manganese a presence is shown when level is above 1ppm (mg/l). 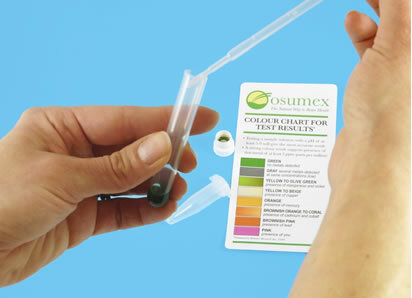 Osumex's Heavy Metals Multi-purpose Test kits test the presence of heavy metals ions to a high degree of accuracy in the body and of a wide range of materials in the environment. 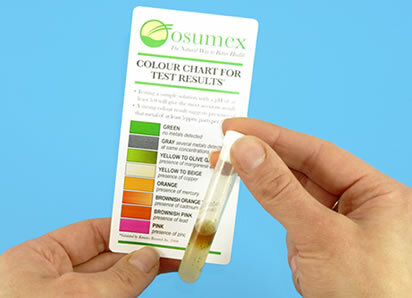 The Heavy Metals Test - General kit was developed for Osumex as a simple to use at home test kit for a preliminary determination of the presence of an identified range of heavy metals. This test kit utilises chemical reagents to show the presence of heavy metals. The free metal ions of the heavy metals, if present, stimulate a colour change to the reagents. Accordingly, the more metal ions are present, the stronger the resultant colour change. A strong colour is indicative of the presence of the metal indicated to at least 5 ppm (ppm = parts per million). The chemicals used in the reagents are bio-degradable and do not further contaminate the environment, especially if disposed off properly after use. - For a more accurate result, the pH of the sample solution to be tested should be at least 5.0. - To test certain items like dishes/glass/dust/dirt/paint/rice/milk/food etc a small amount of distilled water is also required which can easily purchased. - Straining the liquid to be tested would be a good idea to achieve a clear colour change and for an easier reading. Solids such as food, supplements, raw fish, etc. can be tested after it has been soaked in distilled water for 24 hours or treated. For example, to test raw fish, place it in a microwave and heat for about 20 seconds to extract juices from it. The juice from the fish can be tested for the presence of heavy metals ions. - It is advisable for any person considering undertaking a body heavy metals kit to check the suitability of the test first with a health practitioner or doctor before use. - For patients/human testing: various medications or supplements may have an impact on the results, this may include drugs for high blood pressure, intake of Vitamin C, iron & trace supplements, intake of liquids. It is recommended to stop or limit the intake of these a few days before the test. The information on this site is provided for general educational purposes only. It is not intended to replace competent health care advice received from a knowledgeable healthcare professional. You are urged to seek healthcare advice for the treatment of any illness or disease. Please note, this test kit is not suitable for testing alcohol, strong alkalis, highly alkaline or acidic solutions, like washing powders, battery liquids or acids of any kind. The most common heavy metals implicated in acute and/or chronic conditions include lead, arsenic, and mercury. Other individual tests available include aluminium, arsenic, cadmium, chlorine, chrome, cobalt, copper, iron, lead, manganese, mercury, molybdenum, silver, tin, heavy metals. Please contact us for further information.